Uluru, Australia. The waning days of my sabbatical have seen me in Australia again, and again at Australian Catholic University in Melbourne (and more briefly in Sydney and Brisbane), where I have served for the past month as a visiting research fellow. It has been a privilege once more to interact with the ACU faculty, particularly those engaged in interreligious dialogue and comparative theological studies, and it may turn out that I visit again next year. But at this moment I am somewhere quite different: in a motel a few miles from Uluru, that amazing, great rock right in the middle of Australia’s outback. Formerly known as Ayer’s Rock, Uluru is an amazing natural phenomenon with a complicated geological story reaching back over 400 millions years; and it is an awesome spiritual site for the Anangu, that is, the indigenous peoples of Central Australia, who have been continuously resident on this land for 40,000-60,000 years. The land around Uluru is not quite desert, since there is some rain each year, 12 inches or more, but the terrain is dry and sandy, with a range of trees and shrubs and flowers I’ve not seen elsewhere; I saw some birds today, but not the kangaroo and emu and other animals that live around here. It is winter below the Equator, and so at night the temperature drops to the 30s, even if during the day it can reach close to 70. But all of this is the environment for the great rock itself. Hardly anyone climbs Uluru any more, as tourists had done for decades, in deference to the strong views of the native peoples again climbing the Rock merely to see the view. (My impression is that after a sad history and long neglect, Australia, people and government as a whole has in the past 30 years been sincerely making amends and respecting the original Australians, including their reverence for the land. Much remains to be done, but progress is being made, it seems to me.) But people do walk around the Rock, as I did this morning. The path is about six miles long, perhaps closer to seven if one adds in the necessary added trek back to the bus stop at the Cultural Center. It is true that six miles on level terrain, on a cool morning (the 40s rising to the 60s by noon) with refreshing breezes, is no great hardship. Yet the walk goes quite a bit slower than one might expect. I slowed down to read the many informative signs along the way, some of which remind the walker that the cracks and colorations of the rock, its ripples and strata (vertical, not the usual horizontal, since apparently some hundreds of millions of years ago the Rock was up-ended; what we see is actually the one end of a rock now reaching perhaps miles deep into the earth), and also the caves and rare, precious pools of water, all have great power and significance for the people of the land. As several signs said, “the rock details are equivalent to a sacred scripture” ‘ a vivid and perhaps (to us) unexpected text for the reading. 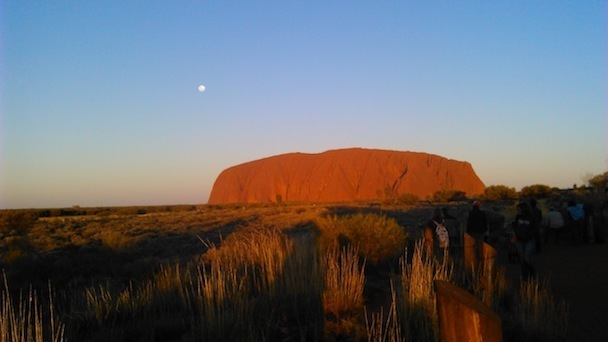 Living near the Rock for millennia, the Anangu people have been reading it over and again, have learned to live with reference to it, and have woven a texture of stories natural and supernatural around it. For them, it is everywhere rich in deep meanings, that can only in a minimal way be shared with the visitor. I also realized as I trekked the final mile away from the Rock to the Cultural Center, that its presence charges the atmosphere and terrain around it as well. I ended up noticing in very fine and small detail all those plants and shrubs and trees which I still cannot name, the little rocks that protrude from the ground like miniature Ulurus (and of course they are part of it), and the interplay of sun and shadow in even the most ordinary section of the path. Perhaps this is how the sacred radiant in nature works: by proximity and touch, in hot open spaces and cool shadows, with gusts and interruptions of the wind, through shifting colors in sunlight and (tonight) in the full moon, the Sacred makes everything around it sacred too, in circles emanating out from its center. I’d better stop here, lest my professorial mind start to raise questions about “the sacred,” “the natural sacred,” the continuities and novelties one can expect in traditions passed down for thousands of years; I’d better stop before I am tempted to explain how this Uluru Rock, though seemingly silent over its millions of years, can truly be said to lay a hand upon even those who just visit it for a day. What does all this mean to the Christian? These are interesting questions here for the academic and the theologian, and important ones too, not to be dismissed as irrelevant. But for now (particularly with my tired legs and palpable sunburn making themselves known a little more forcefully, as the sun sets), I do better to add my voice of reverent appreciation to those of the very many others who have visited here, walked and seen and imbibed this special place — like the innumerable pilgrims who have walked through, around, across, up and down other sacred places in every part of the world where natural and human powers, meanings wordless and worded, invest certain sites with an aura of holiness. But finding it hard to deny the ever-present Jesuit instinct to affirm that here too — today at Uluru — we verify the fundamental truth of “finding God in all things — and places,” I close by citing words from near the beginning of Nostra Aetate: From ancient times down to the present, there is found among various peoples a certain perception of that hidden power which hovers over the course of things and over the events of human history; at times some indeed have come to the recognition of a Supreme Being, or even of a Father. This perception and recognition penetrates their lives with a profound religious sense. It is not just the Hindu and Buddhist, the Jew and the Christian and the Muslim, who know of God’s presence everywhere. And we need not be merely spectators: fifty years after the Council, we can tweak these famous words, to admit that not just they, some and various peoples before us, come to recognize the hidden power of the Mother/Father in such holy places — but ourselves as well.